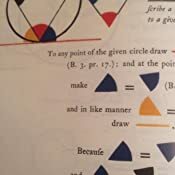 Nearly a century before Mondrian made geometrical red, yellow, and blue lines famous, 19th century mathematician Oliver Byrne employed the color scheme for the figures and diagrams in his most unusual 1847 edition of Euclid's Elements. The author makes it clear in his subtitle that this is a didactic measure intended to distinguish his edition from all others: “The Elements of Euclid in which coloured diagrams and symbols are used instead of letters for the greater ease of learners.” As Surveyor of Her Majesty’s Settlements in the Falkland Islands, Byrne had already published mathematical and engineering works previous to 1847, but never anything like his edition on Euclid. This remarkable example of Victorian printing has been described as one of the oddest and most beautiful books of the 19th century. 5.0 out of 5 starsWhat a great idea! Why didn't I think of this? Instead of trying to follow geometric proofs by tediously identifying what line segments and angles are being discussed, Byrne just color-coded them. All you have to do is look. It reduces the tedium of a tough argument to simple. 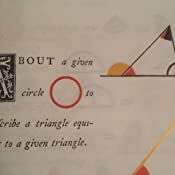 The book cover shows the idea being used to illustrate the Pythagorean theorem. Great idea. My only complaint about the book is that the color renderings aren't as good as they should be. It's not enough of a problem to dock a star, but hopefully the publishers will make a more vibrantly colored edition. I'd buy it if they did. 4.0 out of 5 starsA Beautiful Book that is Generally Easier to Understand. I really enjoy this edition. It is in some ways easier to read than a traditional publication. It is beautiful! I really want to purchase books seven through thirteen! Sometimes, however, the use of colors instead of letters makes it more difficult to read. The script, as should be expected, utilizes the antiquated form for "s." I also miss the commentary found in traditional publications, but this conversation is beyond the book's purpose. Son loves this gift book. Was purchased for him at his request. He really likes the color illustrations. Not sure why, but a good choice for the math geek in your life! I first saw this at the Morgan Library and I had to have it. I looked for a long time before I finally found it. It's a fetish object for me, a non-mathematician who loves mathematical ideas. I love it. It's gorgeous. It's a work of art (not a workaday textbook -- at least, not yet). This is a fantastic book. The preface explains the whole thing. Using colors instead of labels really cleans up the diagrams and proof text. If you compare one of the proofs from this book to a traditional one the advantage is clear. Even if you don't need to learn this material for school or work it is a beautiful book to browse. 5.0 out of 5 starsA must for any graphic designer! Great publication, fantastic paper, well printer publication.